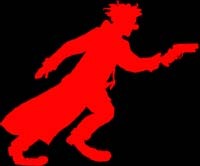 › Ant's Clown Runner page. "STREET KIDS" - Proposed documentary featuring street kids and how they don't want or need help. "THE STALKER" - Short or feature about a stalker who's quarry turns the tables. This is a story idea by Kristijana Maric. "Killers" - 2 variations: short, random kill thing. Slaughter Trip. 7/11 Guy - Carzy things that happen on the night shift. "John & Marcia" 1 scene short based on cliche'd couple running toward each other through a field to embrace. Ends in Marica shooting John to pieces. Proposed for Trasharama entry. "JFK Assassination reinacted with Ken and Barby dolls". Proposed for Trasharama entry. › Added script draft to workshop page (Leon's interview scene)! 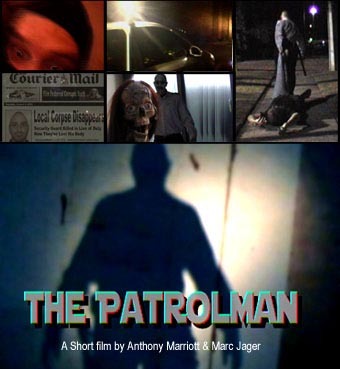 › "The Patrolman" can now be watched from this page! "Clown Runner" - Will be a short film parody of "Blade Runner"
You have to have seen Ridley Scott's "Blade Runner", to appreciate this parody. I assure you it is worthwhile. Possibly the best (definately the most accurate vision of a possible earth future) sci-fi ever! Note this is to be parody. NOT satire! We honour Riddley Scott's film with the highest regard (even if he doesn't) and seek only to bring a humerous new slant on a fabulous film and mock fun at people's fear of clowns. "Quite and experience to live in fear, isn't it?!" To learn more, go to the workshop page. Musician(s)/composers who can mimic Vangelis' style to make similar music with various clown-like/circus polka themes. Always inviting ideas, stories and scripts for a short film I wish to submit for Trop Fest. Most likely be named "The Lists" or "Burdens" or "Undesirables"
The government tasks a man to kill 'undesirables' (people the government deems to be a 'burden on society'). Short Film entitled "The Patrolman" © 2006 for the festival "Trasharama a Go Go"
Synopsis:This is a dark but funny short 'zombie' film. "We wanted to show the drone-like on-the-job tedium of patrol work and compare it to 'being a zombie'. We're making fun of the security industry, night-shift work and then paying homage to Romero's zombie stylings with some good old fashioned zombie violence... er...we hope... You be the judge"
If you want a copy, I can mail it out as either an .avi file to play on your PC or as a DVD player playable DVD.